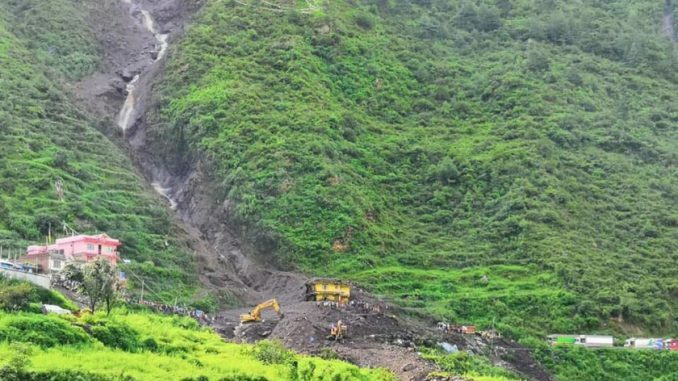 Pokhara—At least five persons were killed and 4 other went missing as landslides buried a settlement at Timure in Gosaikunda Rural Municipality- 2 last night. According to District Police Office Rasuwa, 12 persons have injured during the incident that occurred at 1 am in midnight. Two huts and a hotel were buried by landslides. A police beat also came into mud during the incident which is 25 km far from district headquarter Dhunche. Deceased have been identified as Shyam Shrestha, 42, Bikram Shrestha, 27, Mangale Tamang, 45 and Resham Khadka, 37, of Sindhupalchok district and Migmar Gumbu. Most of the deceased are said to be drivers. According to Rasuwa Chief District Officer Krishna Paudel, the incessant rainfall and flood triggered the landslide and the search operation of four missing persons is undergoing.